Canadian News : G.T.A 404 Series: Pagsalakay ng Pinoy! 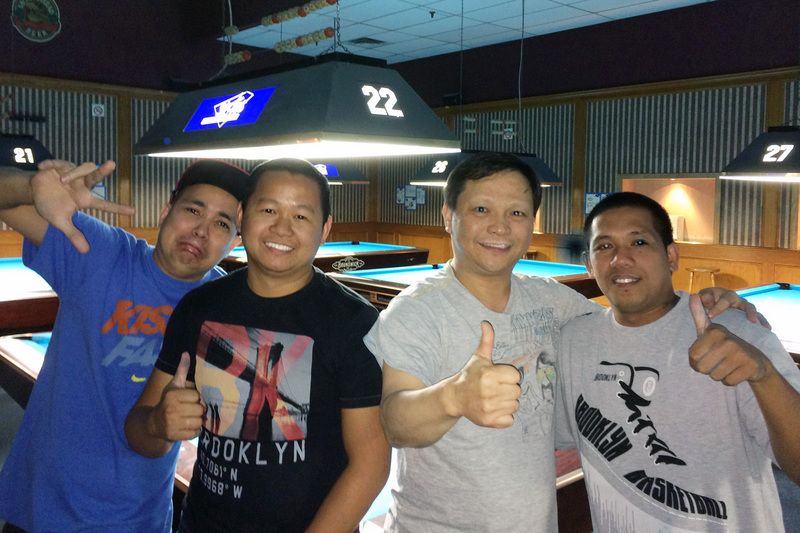 Another season of the long running ‘404’ series kicked off this past weekend (September 26th & 27th) at the Shooters Snooker & Sports Club in North York. Fifty–eight players were registered when the tournament started with many new faces again competing for the tournament title. New players in the Shooters tournaments are beginning to represent almost 20% of the tournament field. After wrapping up on Day 1, Norberto de Carlos, Jehlar Fernandez, Kevin Oliveira and Jaypee Castillo were undefeated on the ‘A’ side of the draw while Sumon Sarkar, Toby Huang, Richard Murray, Romeo Zulueta, Martin Yakobazzo, Isaac Ramos, Shane Gummerson and Jeet Kandhai worked their way through the one loss ‘B’ side to be able to make a return appearance on Sunday. In the ‘A’ side Sunday matches Fernandez edged de Carlos while Castillo defeated Oliveira setting up an ‘A’ side final between Fernandez and Castillo. Meanwhile, over on the ‘B’ side of the draw, Huang and Ramos were successfully working their way through the remaining field setting up matches against de Carlos and Oliveira respectively. However, the strong play that saw de Carlos and Oliveira enter Sunday on the ‘A’ side of the draw continued in their ‘B’ side matches as de Carlos overcame Huang and Oliveira emerged with a victory over Ramos. This set up a ‘B’ side semi final with de Carlos and Oliveira in which de Carlos came out on top. In the ‘A’ side final Fernandez continued his recent strong play by decisively defeating Castillo sending Castillo to the ‘B’ side and Fernandez to the “hot seat”. In the ‘B’ side final Castillo made quick work of his Pinoy counterpart de Carlos setting up an all Filipino tournament final with Castillo and Fernandez. Perhaps with a measure of revenge on his mind Castillo wrapped up the tournament win with a solid 6-2 victory. Congratulations to Jaypee Castillo on his tournament win and to Jehlar Fernandez for his recent consistently strong play. This was Jaypee’s first win in a significant tournament over the past several years. Thank you to all the participants for a great weekend of pool and welcome to those who had not previously participated in a competitive 9 Ball tournament on the 9 footers at Shooters. Next up for Shooters is the Group Shootout on October 3rd and 4th followed by the 2nd leg of the wildly successful ‘Amateur’ series on October 10th and 11th. Check the Shooters Snookerclub Facebook page for dates and details. We’re all looking forward to another year of good competitive pool, full fields and expanding the interest in pool in Southern Ontario.